There are many interpretations of Bannockburn. Sir Walter Scott’s epic poem, The Lord of the Isles, published in 1815, is one of many literary works on the subject, and its hero, King Robert the Bruce. 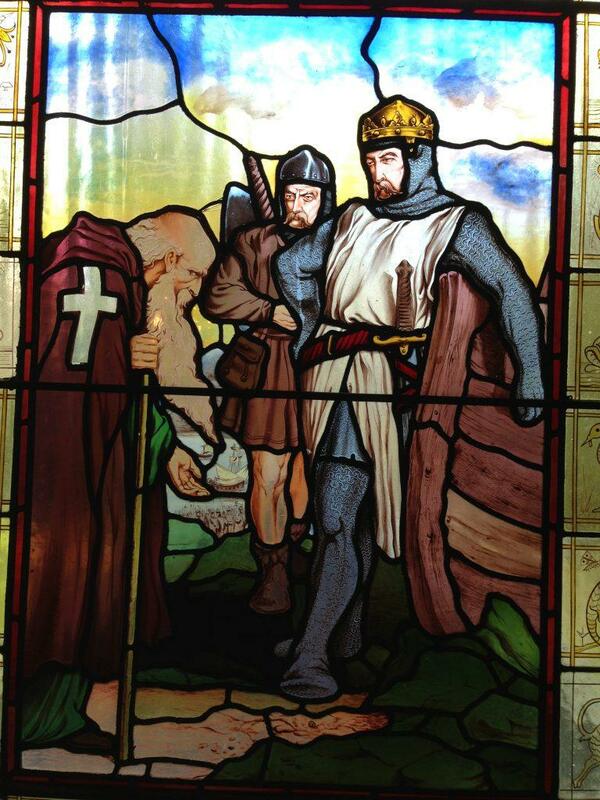 An episode is illustrated here in a window by Glasgow stained glass artist John Cairney in 1872. Scott’s work was popular for at least a century. At 12 noon on Thursday 1 May 2014, Professor Robert Crawford of the University of St Andrews gave a talk on Bannockburns, the title of his new book, which deals with the literature of Bannockburn over the past 700 years. In 1314, the poet-in-residence was Robert Baston, who came north with Edward II to write about the great English victory. Captured and held prisoner by Bruce for 20 years, he wrote one of the greatest anti-war poems of the middle ages, before gaining his freedom. He wrote in Latin, and the poem was translated in 2004 by the Scottish Makar Edwin Morgan. Robert Crawford, himself a leading Scottish poet, talked about the influence of Bannockburn on Scottish literature.